Since last month’s (fairly brief) news item regarding Marc Goossens having signed to drive Wim Noorman’s Eurotech Marcos LM600 (with Danny van Dongen), we’ve had the launch of the bright green GLPK Corvette C5-R (for Kumpen / Longin). With the SRT Corvette and the former GLPK Viper in the Belcar Class 1 mix as well, plus perhaps a little ‘needle’ as well, 2006 is certain to provide plenty of unique, Belcar action at the front of the field – as well as the middle and the back. The Marcos LM600s (and Cor Euser’s Mantara development) have been providing entertainment in various series for almost a decade: Americans have swooned at the antics of the grunty, colourful beasts in FIA GT races in the USA - and even at Daytona too. Euser was the hero of many an FIA GT race in Europe, and has since raced in British GTs, Euro GTs and in Spain. 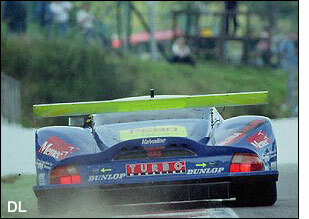 Calum Lockie was a British GT Champion (partnered by Euser) in 2000 (the start at at Spa, right, with Marcos on the front two rows) – and six years later, Goossens and van Dongen will be out to secure another national title. Or are ambitions set a little lower? Joost Custers found out – from Eurotech’s Wim Noorman. “In order to counter all speculation, the car we will race is a freshly built Marcos LM600, in 2003 spec.,” explains the Eurotech boss - adding that all Marcos racing cars built since 1999 come from Eurotech. 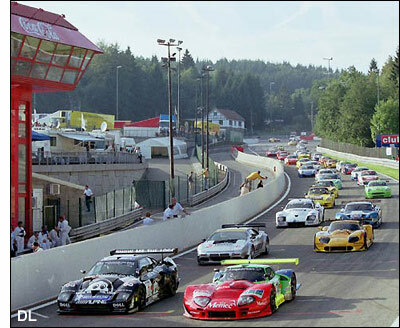 That’s an impressive time at Spa….. that's Cor Euser on the left, using all the track at Spa.